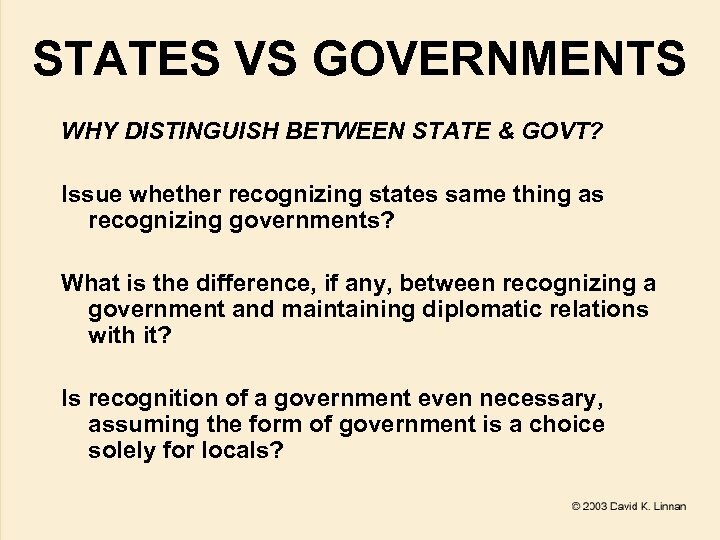 STATES VS GOVERNMENTS WHY DISTINGUISH BETWEEN STATE & GOVT? 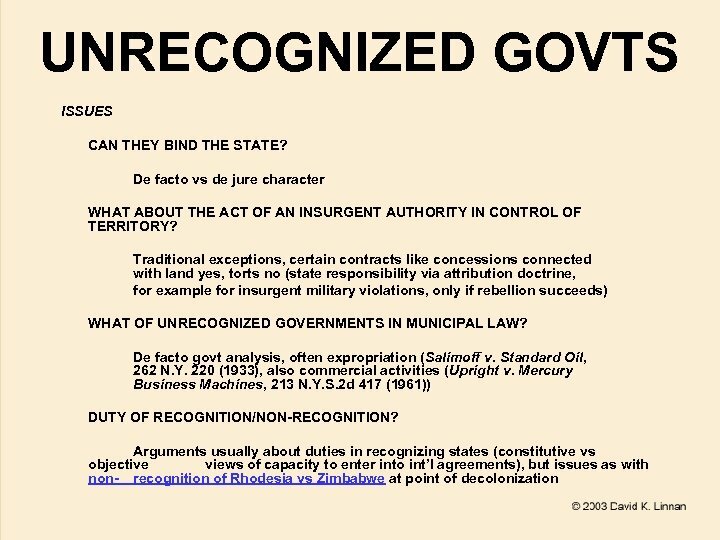 Issue whether recognizing states same thing as recognizing governments? 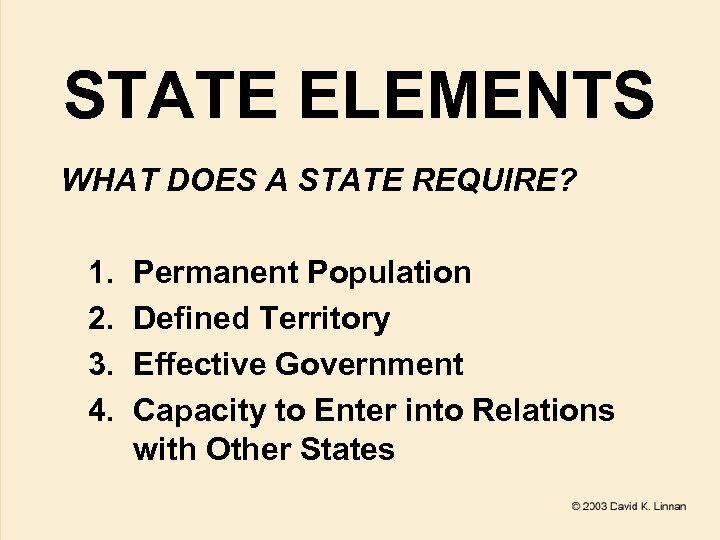 What is the difference, if any, between recognizing a government and maintaining diplomatic relations with it? 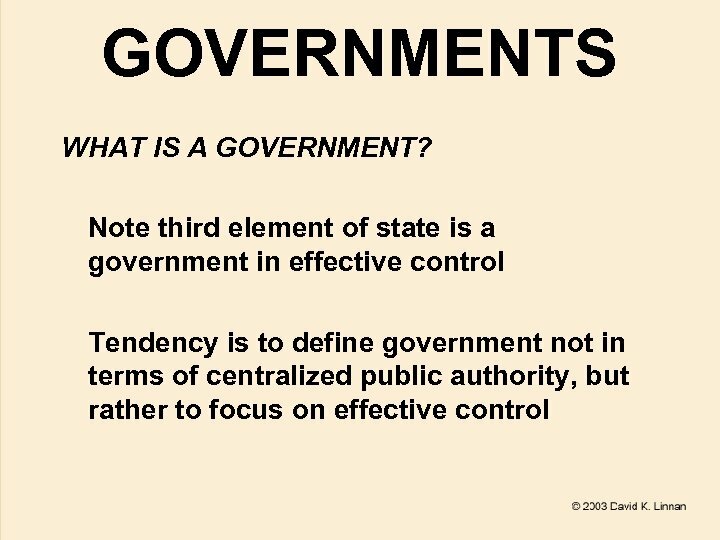 Is recognition of a government even necessary, assuming the form of government is a choice solely for locals? 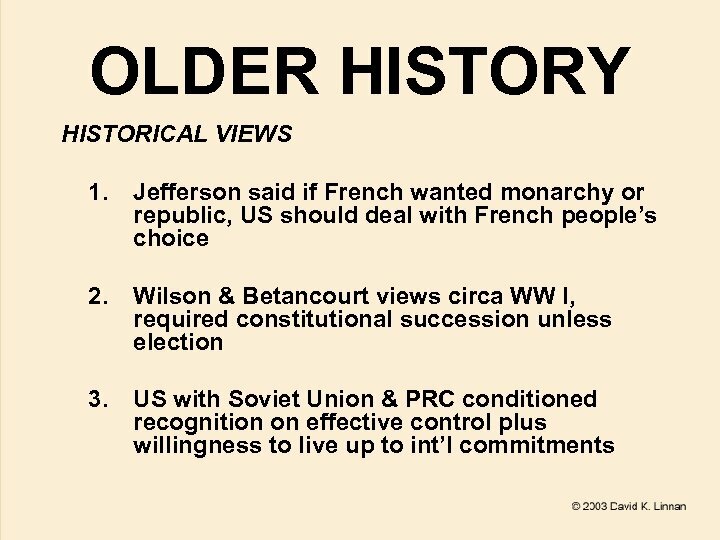 MODERN HISTORY HISTORICAL VIEWS (CONT’D) 4. 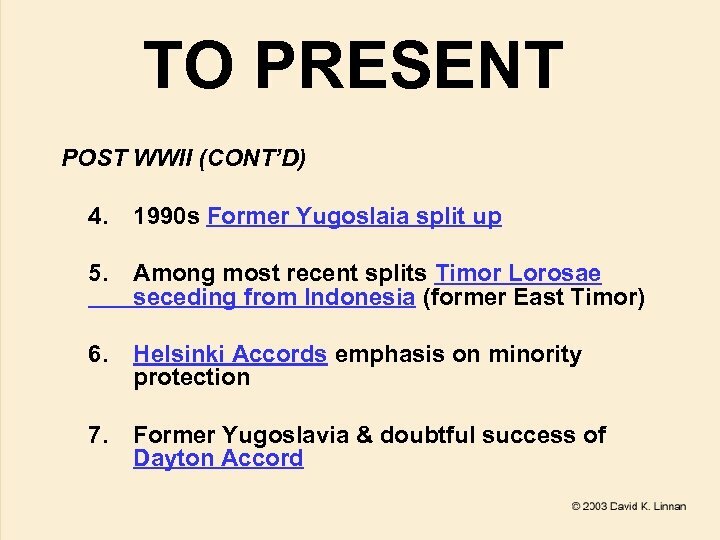 Truman & Cold War limitations on rcognizing govt of “Communist Subversion” (Baltic Countries) 5. 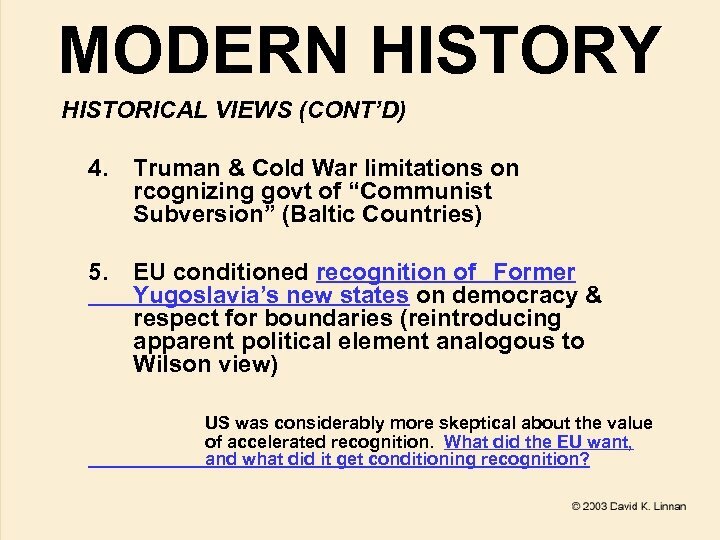 EU conditioned recognition of Former Yugoslavia’s new states on democracy & respect for boundaries (reintroducing apparent political element analogous to Wilson view) US was considerably more skeptical about the value of accelerated recognition. 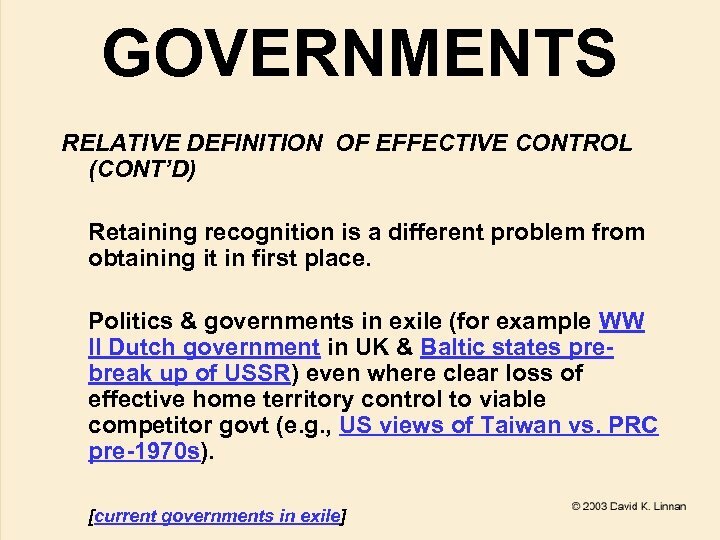 What did the EU want, and what did it get conditioning recognition? 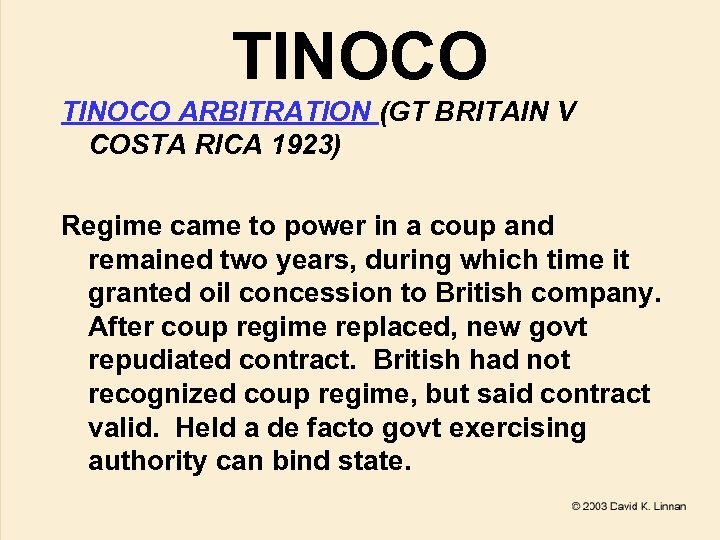 TINOCO ARBITRATION (GT BRITAIN V COSTA RICA 1923) Regime came to power in a coup and remained two years, during which time it granted oil concession to British company. After coup regime replaced, new govt repudiated contract. British had not recognized coup regime, but said contract valid. 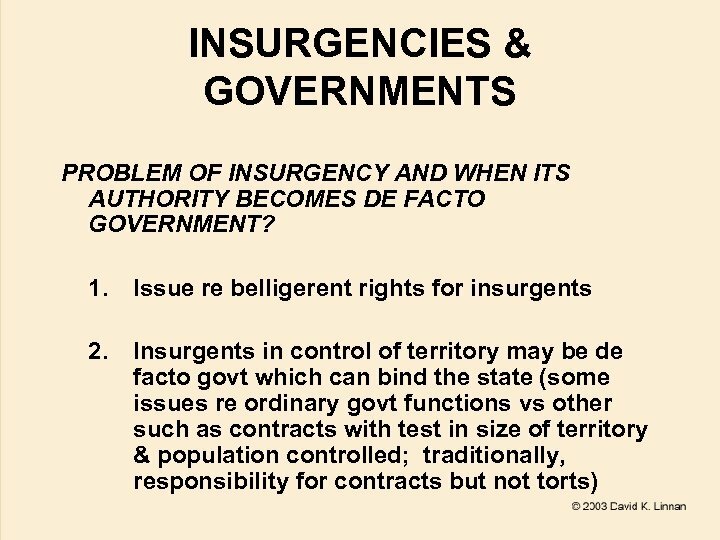 Held a de facto govt exercising authority can bind state. 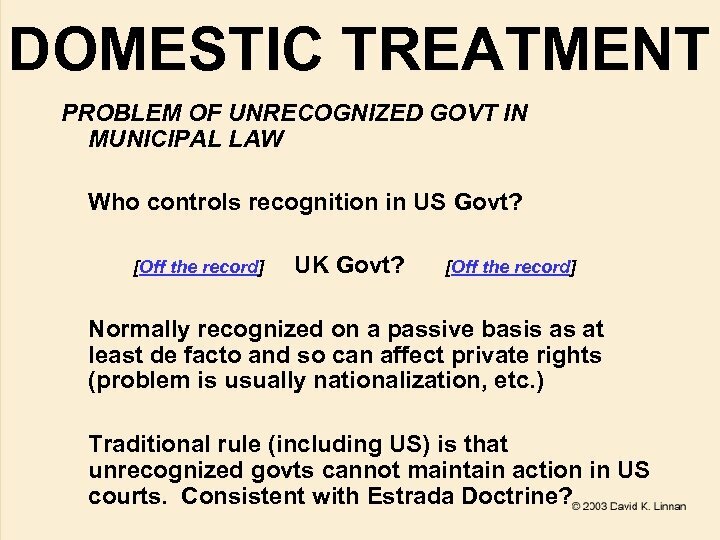 DOMESTIC TREATMENT PROBLEM OF UNRECOGNIZED GOVT IN MUNICIPAL LAW Who controls recognition in US Govt? [Off the record] UK Govt? 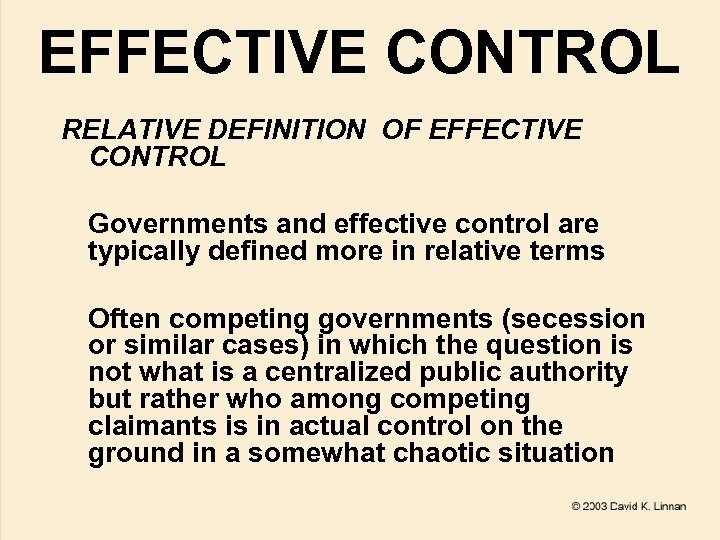 [Off the record] Normally recognized on a passive basis as at least de facto and so can affect private rights (problem is usually nationalization, etc. ) 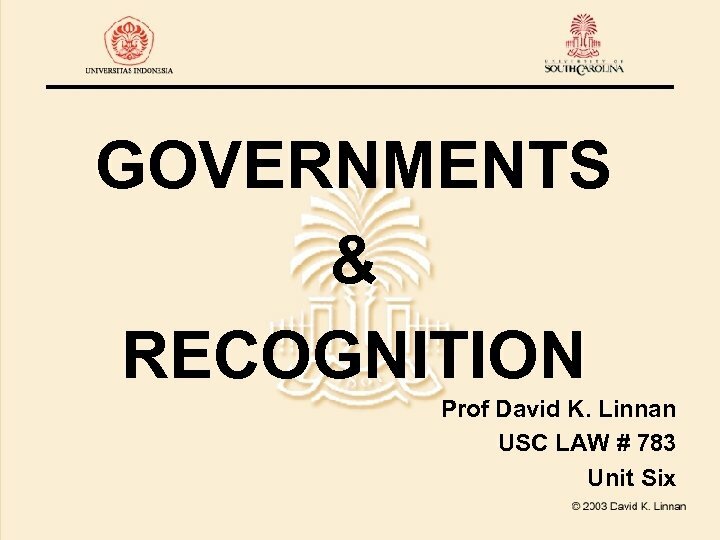 Traditional rule (including US) is that unrecognized govts cannot maintain action in US courts. 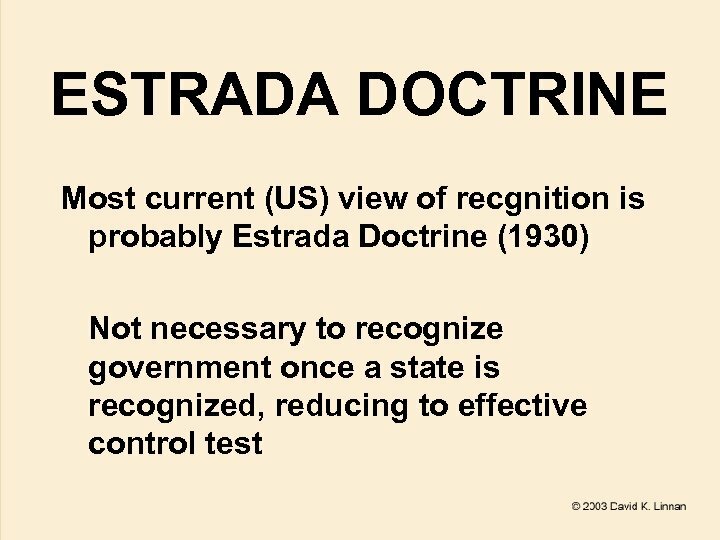 Consistent with Estrada Doctrine? 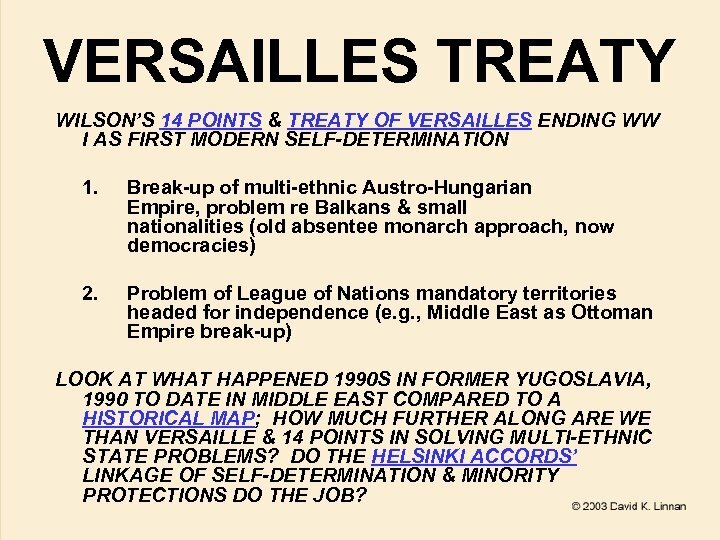 VERSAILLES TREATY WILSON’S 14 POINTS & TREATY OF VERSAILLES ENDING WW I AS FIRST MODERN SELF-DETERMINATION 1. 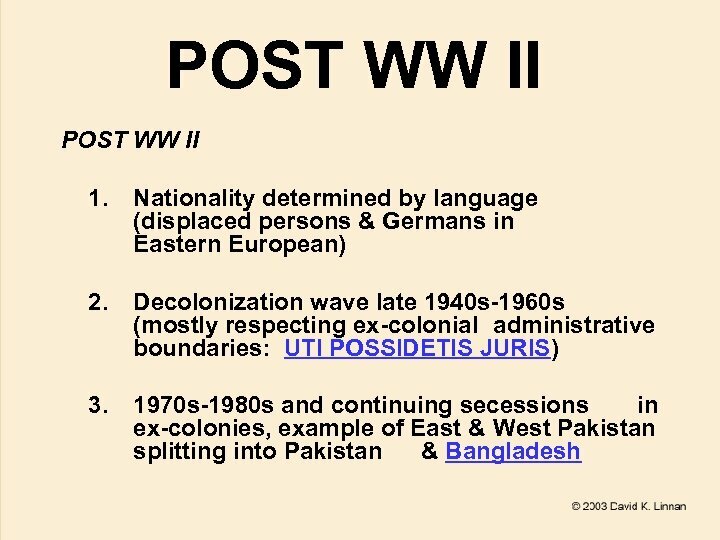 Break-up of multi-ethnic Austro-Hungarian Empire, problem re Balkans & small nationalities (old absentee monarch approach, now democracies) 2. 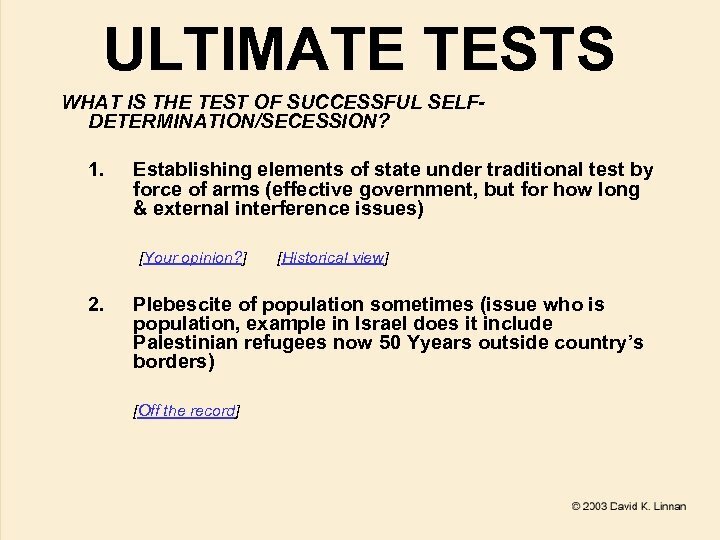 Problem of League of Nations mandatory territories headed for independence (e. g. , Middle East as Ottoman Empire break-up) LOOK AT WHAT HAPPENED 1990 S IN FORMER YUGOSLAVIA, 1990 TO DATE IN MIDDLE EAST COMPARED TO A HISTORICAL MAP; HOW MUCH FURTHER ALONG ARE WE THAN VERSAILLE & 14 POINTS IN SOLVING MULTI-ETHNIC STATE PROBLEMS? 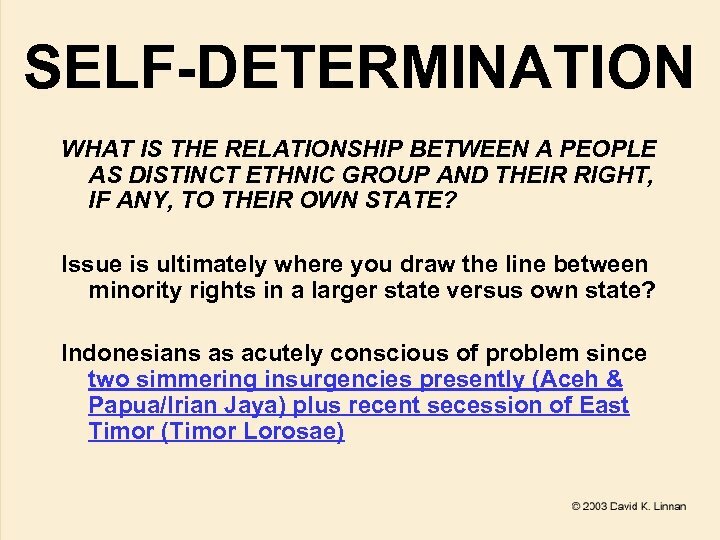 DO THE HELSINKI ACCORDS’ LINKAGE OF SELF-DETERMINATION & MINORITY PROTECTIONS DO THE JOB? 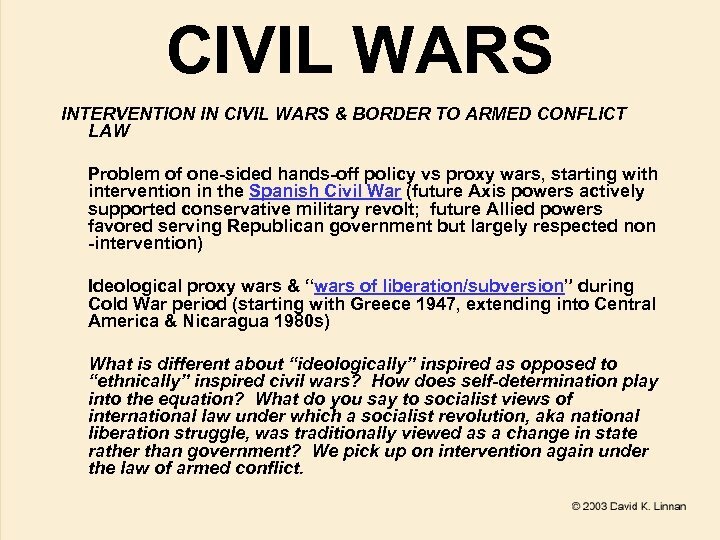 CIVIL WARS INTERVENTION IN CIVIL WARS & BORDER TO ARMED CONFLICT LAW Problem of one-sided hands-off policy vs proxy wars, starting with intervention in the Spanish Civil War (future Axis powers actively supported conservative military revolt; future Allied powers favored serving Republican government but largely respected non -intervention) Ideological proxy wars & “wars of liberation/subversion” during Cold War period (starting with Greece 1947, extending into Central America & Nicaragua 1980 s) What is different about “ideologically” inspired as opposed to “ethnically” inspired civil wars? 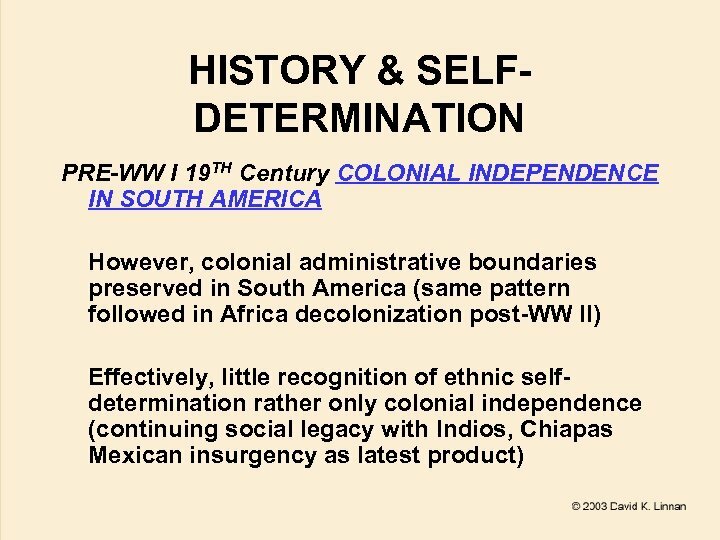 How does self-determination play into the equation? 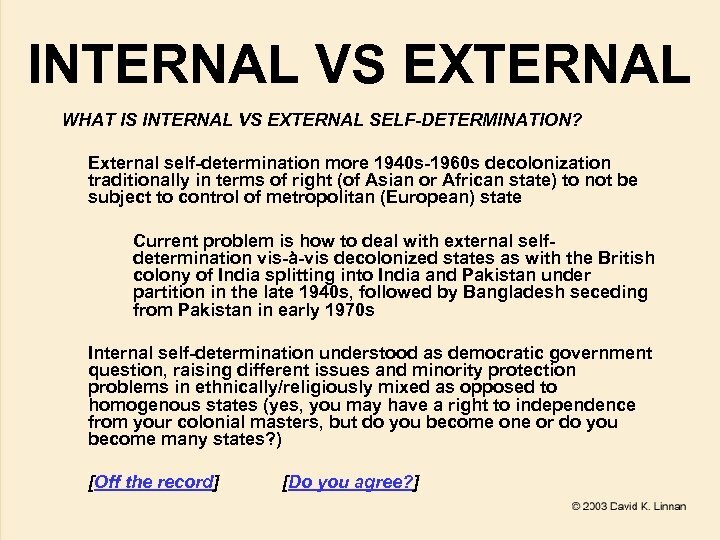 What do you say to socialist views of international law under which a socialist revolution, aka national liberation struggle, was traditionally viewed as a change in state rather than government? 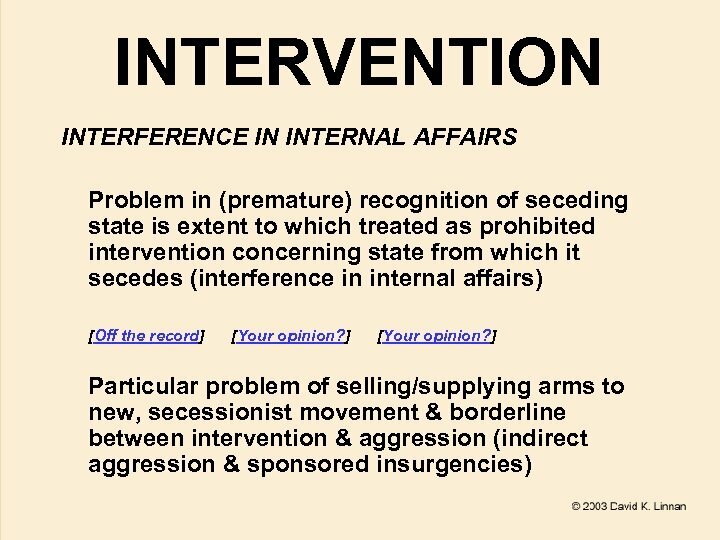 We pick up on intervention again under the law of armed conflict.